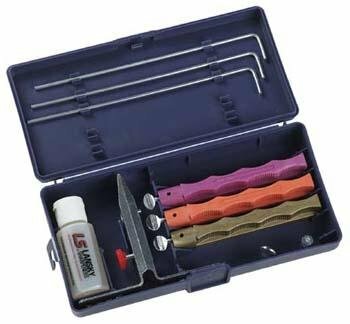 Lansky standard Diamond kit offers the ultimate in sharpening technology. With a diamond plated surface ranging from coarse to fine, Diamonds, being the hardest known substance, provide a very aggressive grit, which makes sharpening even the hardest and dullest blades, an easy task. The Lansky Diamond Kit contains an coarse diamond hone, medium diamond hone, fine diamond hone, multi angle knife clamp, honing oil, and 3 guide rods. All parts are contained in a custom molded storage case.